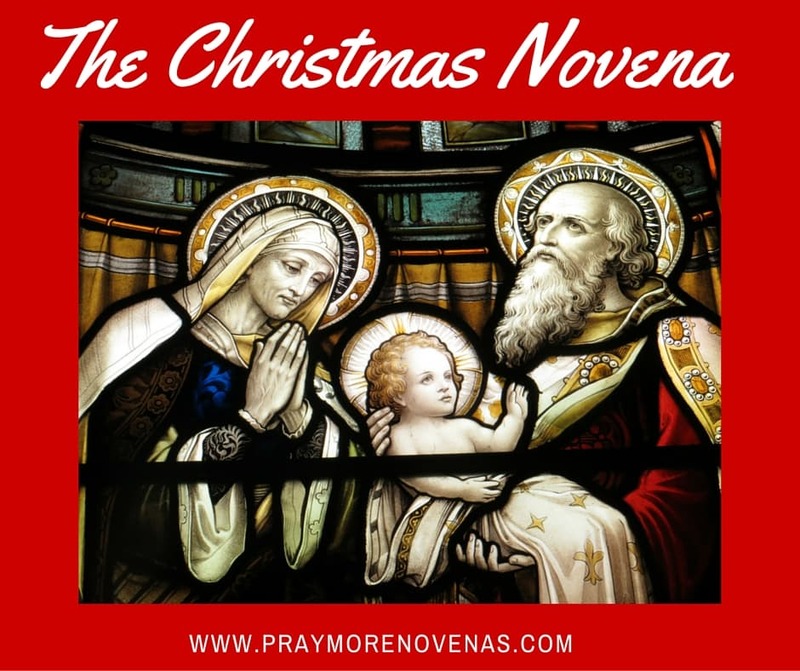 Here’s Day 3 of The Christmas Novena! Please Lord accept my dialogue with You. Please hear my prayers. Thank You Lord Jesus. Dear God Almighty, Holy Spirit, The Paraclate, St Jude, Holy Mother Mary, Undoer of Knots, please undo the snarls of knots in my life. Please heal my stomach ailments.ALL YE HOLY ANGELS AND SAINTS I implore your aid, grace, descernment, and providence into my soul and for my intentions listed below for myself, Son Christopher, mother Margaret , siblings, friends, all my relatives and loved ones, who this daily Novena is intended for and for the whole world. Thank You Lord Jesus Christ. Blessed Holy Mother Mary with your intercession and that of All The Holy Angels and Saints The Merciful God answered all my prayer requests. He delivered my soul from death and honored me with all my needs. Thank You Lord. Praise the Lord O my soul and all that is within me, Praise His Holy Name. Dear Lord God Almighty; Holy Mother Mary, Our Lady of Lourdes, Blessed St. Joseph, Blessed St Michael the Archangel, St. Jude, ST. ANNE, Blessed St. Padre Pio, All you Holy Angels and Saints. l invoke your names to please intercede on my behalf for the Almighty God to forgive my sins, to have mercy and pity on me and to please accept my never ending Thanks and Praises, For God to please hear my prayers and continue coming to my aid. I need you desperately God. I Knocked, l asked and sought your HELP Jesus. I trusted and believed in Your WORD that by your Stripes l am healed and You O God HEALED me. Almighty God You had pity and mercy on me just like You did for Hezekiah. Thank You Lord Jesus for hearing my cries. I adore Thee my Lord. l love Thee my God. l praise You Jesus. Glory and Praises be unto Thee Lord God Almighty. How can l thank Thee Lord Jesus. I will call upon Thy Holy Name to Glorify Thee. I exalt Thy Blessed Holy Name, I will testify to the whole world for what you have done for me. I am striving to do your Holy Will in your glory. I extol you and testify your wonderful deed to ALL. l shout your Mighty Name to the world and testify to them how Good you have been to me. Thank you Sacred Heart of Jesus. Praise the Lord O my soul. Thank you Holy Mother Mary, Thank you Blesseds St. Joseph, St Anthony, St Jude, St Peregrine, St Anne, St Bernadette, St Benedict, St Faustina , St Catherine, St Teressa, St Maria Goretti, St. Margaret, St Thomas, St. Francis, St. Padre Pio, St Michael the Archangel, St Gabriel, St Raphael, St Rita and All you Holy Angels and Saints for interceding on my behalf to the Almighty God. Please continue to pray and intercede on my behalf for God’s strength; for God’s corporal and spiritual healing mercies and blessings. Please God help me to gain some weight back. I beg you Lord Jesus and l thank You Lord for gaining some back and also allowing me to receive all benefits due to me. Glory be Thine. Praises be unto Thee. Please God grant me your protection from the devil and please pour your amazing Grace upon me, on my son Christopher, mother Margaret, brothers and sisters, all my loved ones and all who have ask for my prayers. Thank You Lord God Almighty. Lord Jesus please forgive our sins, fill us with your Holy Spirit, encircle us with your Holy Ghost Fire, wash us with your Precious Blood from the crown of our heads to the soles of our feet. Heal me with your Stripes, safeguard, strengthen, guide and protect me, my son Christopher, mother Margaret, brothers and sisters and all my loved ones from all evil and satan, the devil, the enemy who is prowling around us to ruin our souls. Please God keep me safe from diseases, calamities, my enemies, satan attack and spiritual warfares. Please God bring my devided family together, closer to each other and bind us with Love, Peace and Unity. Lord please be in our midst on this earth and where there is war, disaster and calamities, grant us your Peace, protection, grace, deliverance and mercy. Have pity on me please Lord Jesus Christ. Sanctify my soul for in Thee do l take refuge and wait. In your WORD l trust, believe, depend and wait. Your Word that shall never pass. Please God, do not allow my enemies the devil to defeat or shame and laugh at me. Please Jesus defend me from the malicious enemy. In your Sacred Wound please hide me. O Good Jesus hear me. Lord please listen to the prayers and the needs of all those who are calling upon your Holy Name, including this your poor servant; me Edith and in your mercy, please Lord God hear and answer my prayers according to Thy Will. Please do not look upon my sins or the sins of my parents, child, Siblings, family or forefathers but in your mercy please Lord forgive us our faults and hear my cries. Thank You Lord Jesus. DEAR LORD IN JESUS NAME PLEASE HELP US(ANGIE, CHRISTOPHER, RIMPY AND JONATHAN H)SEE THE REWARDS OF ALL OUR SACRIFICES THAT WE MADE FOR SO MANY YEARS AND LET OUR MEMORIES OF THIS WORK NEVER BE FORGOTTEN NOR EACH OTHER PLEASE HELP JONATHAN H CONTACT RIMPY IMMEDIATELY SO HE ASKS HER OUT AND THEY BEGIN DATING ONE ANOTHER AND HE COMMITS TO HER 110% FOR LIFE. PLEASE BLESS THEM ALL WITH A VERY BRIGHT FUTURE AND GOOD HEALTH, WEALTH AND THEY ARE ALWAYS UNITED WITH YOU LORD AND JESUS CHRIST. WE LOVE AND TRUST YOU. THANK YOU. AMEN! Please let Missy and I at work get a long, please help me relax so I stop making mistakes and get fired. Dreams have been very important in Scripture and are still very important for us. This final week before Christmas, when God gave us the gift of His Son, we should contemplate our dreams. Dreams are very important in Scripture and are still very important for us. Many times we may all dream of being a better person, a stronger Christian, to improve our own lives in some way. We may also dream on the betterment of our society, our community or the world. Now, at this time, at this last week before the coming of our Savior, reflect upon your dreams. For these are the dreams that you want to be reflecting upon so that you know what you need to ask the Lord to give you as a present on Christmas Day. Dear Lord I ask for Your assistance. To help me through this difficult time. To relieve me of my stresses anxieties my sadness and fearfulness. I cannot do this alone and I know that I need you Lord to intercede and be immersed in my body. With You everything is possible. Please Lord help me through this difficult time and allow for everything to work out in a positive manner. I promise to give back and to walk in Your footsteps. Dreams have been very important in Scripture and are still very important for us. This final week before Christmas, when God gave us the gift of His Son, we should contemplate our dreams. Many times we all may dream of being a better person, a stronger Christian, to improve our own lives in some way. We may also dream on the betterment of our society, our community or the world. I dream my daughters come back, commit, to the Catholic Church, as also for my brother and sister. I dream that we all may rejoice, laugh and sing with God because we ar with Him. I dream that all of God’s children may live their days in anticipation of Glory in Heaven. Lord I pray that I will overcome my burdens through these tough times. That my family will find peace, strength, and guidance in you lord. Also that all of your flock will soon return home to you for true revelation! Please bring my family back to the Catholic Faith with conversion of their family & my sons fiancé & family. Bless my sons engagement & guide them to be married in the Catholic Church. Bless & comfort Sam Armstrong & his family in his last stage of cancer. That he will be able to attend his sons wedding on 12/29/18. For the holy souls in purgatory especially my family,friends & those I know. Comfort those who’ve lost loved ones during this season & bless ken hawes, family, dear ones with faith, hope, love,trust since his recent dx ALS. May I love, faith, trust in the Trinity, Mary,Angels & saints grow in guidance for me to bea witness to others. Please bring my nephew, Lorenzo and his wife back to the Catholic Chuch/Faith. Dear Jesus, please heal my family and I of our burdens. Please heal us of anxiety, depression, fibromyalgia, heart disease, diabetes, allergies, asthma and sciata.